Azamara is offering five departures on a 9-night Cuba Intensive voyage that includes overnights in Cuban cities to enrich your experience! Immerse yourself in the vibrant nightlife and stunning art-deco architecture of Miami before setting sail. An extended stay in the exciting city of Havana is the perfect way to kick off the Cuban leg of your journey. After exploring the historic neighborhood of Vieja Habana (Old Havana), get a taste of the real city at a lively Salsa club. After a day spent on your boutique hotel at sea, it’s on to Cienfuegos, where elegant French colonial charm meets fiery Caribbean passion. Embrace warm tropical breezes as you take in the 17th-century fortress, Castillo de Jagua, as well as stunning neoclassical, art nouveau, and art deco architecture. 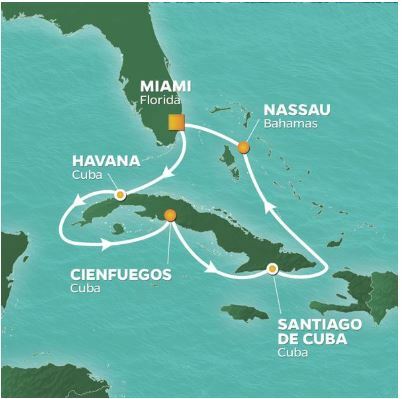 Then it’s another luxurious day at sea—perfect for lounging poolside, pampering yourself at Sanctum Spa, and enjoying show-stopping performances—followed by an overnight stay at Santiago de Cuba. Visit UNESCO World Heritage-listed Castillo del Morro, the Colonial Historic Center of Santiago, and Basilica of El Cobre, Cuba's most sacred religious site. Return to Miami with a few adventures under your belt and some new favorite destinations. 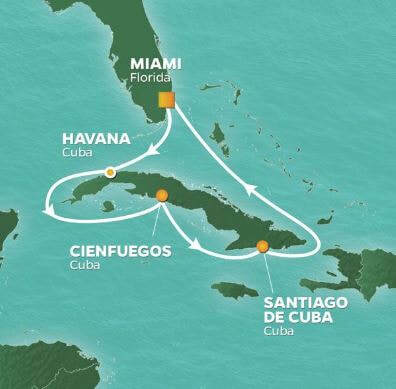 We’re fully compliant with U.S. policies on traveling to Cuba, and ready to set sail! 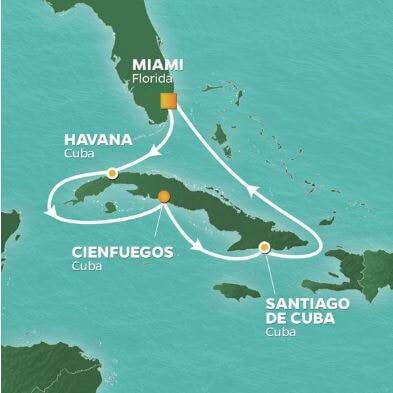 Questions about our Cuba voyages? Read our FAQs. WHAT’S INCLUDED? All of this. Suite guests enjoy even more inclusive amenities. Guests wanting to disembark in Cuba must be on an Azamara Club Cruises tour or certify that they otherwise meet the permitted travel requirements for Cuba. All guests will be required to secure a tourist visa to travel to Cuba, whether they opt to remain onboard the ship or disembark while in Cuba. This will be managed by Azamara Club Cruises at a cost of $75 per guest, which will be added to the guest folio onboard. Each guest will receive their Visa at the port during check-in and will be responsible for providing their Visa to the Cuban authorities upon arrival in Cuba. If a guest loses their Visa, they will be able to purchase a new Visa onboard.